What's that lurking in my system tray? It's the tool that ensures that I keep everything updated on a regular schedule. You can try it too! I think you'll like it. I just realized that there is a small problem. Events are supposed to be saved when the program exits, but that doesn't happen when the program is closed by Windows closing. That will be fixed. Until then, if you make any additions or changes, you might want to close and restart the program to be on the safe side. - Changed so events are saved whenever they are created/edited/deleted. I realized that it would be useful to be able to reorder tasks within an event, so I have implemented that. 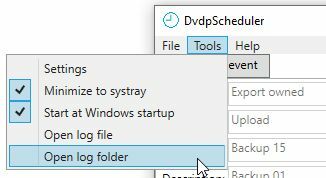 After using DvdpScheduler for a while (quite successfully) I have started to wonder if it really is necessary to have "Start DVD Profiler" as a task. It would be just as easy to do this by default, e.g. check if Profiler is running, and start it if it is not. The only reason to keep things as they are is if one would, for some reason, want to not start Profiler if it is not running, and thus also skip the other task(s) in that event. Personally I can't think of such a reason, but I would be interested to know if anybody else can. - "Export" added as a task type, so you don't have to rely on an existing command file to run an export to XML. - "Start Profiler" has been removed. This is now done automatically if Profiler is not running. - The task for running executables (.exe files) now allows command line arguments to be specified. - The log file messages have been improved to show which command files or executable files that were run. - The help file has been updated with important changes highlighted in yellow. If you are upgrading from version 1 and you already have an export task that uses your own command file, that will of course still work. The only real difference is that when running an export through the new Export task, DvdpScheduler can keep track of the progress and make sure that no other task starts before the export is completed. If you currently have a "Start Profiler" task, you will still see it when you start version 2 the first time, but it will be removed on subsequent runs. If DvdpScheduler was not running when an event was supposed to execute, the schedule for that event was not updated. It would show up in red, and you would have to manually set a new sheduled date for that event. Now DvdpScheduler checks for events that have been missed, and automatically sets the next date based on when it would have been scheduled if DvdpScheduler had been running all the time. The missed events will be logged to the log file, and you will get a message box informing you that there were missed events. In Settings, the path for DvdProfiler's executable has been removed. DvdpScheduler picks this up from the registry instead. Holding down the Shift key while clicking the close button (the X) actually closes the program, otherwise it just minimizes it, as before. Some minor cosmetic changes have also been applied. Backup task now allows the same selections as the backup in Profiler. And it remembers your selections. HINT: If you don't want to run an event on a schedule, but only on demand, set it to "Run once" with a date that is in the past. You can then use the "Run now" function to run that event whenever you like. It adds three more items to the category selection for Export. Well, if you work a lot with exporting XML you can create events that lets you export selected, flagged or filtered at will, with just a click of a button. The "Run now" context menu item has been replaced with a button for easier access (as you can see in the image above). The logging has also been changed, so up to seven log files are kept. The new menu item in the Tools menu lets you open the log folder so you can access older log files. Read all about it in the updated help file! Truly masterful piece of work.